Glow discharge is available with the following systems KSC7620, the KQ10837, and the KQ150 series as an optional accessory. GloQube available form Quorum as a stand‐alone unit. We can supply a non‐Quorum stand‐alone glow discharge system. The primary application of glow discharge is as a technique for the surface modification, or 'wetting', of newly‐evaporated transmission electron microscopy (TEM) carbon support films. We offer four options, the standard KSC7620 Compact Sputter Coater has a built‐in glow discharge function. Alternatively, the KQ150R (rotary‐pumped) and KQ150T (turbo‐pumped) sputter/carbon coating systems can be fitted with an optional glow discharge attachment. K025235 & K025261 GloQube is a stand‐alone unit. GloQube® is a compact, easy‐to‐use glow discharge system The GloQube® is a compact, easy‐to‐use glow discharge system primarily used for the hydrophilisation (wetting) of TEM support films and grids. Other applications include surface modifications, for example for enhancing polymer bonding. The GloQube® is available in two formats. The GloQube‐D has two independent vacuum chambers: a clean chamber for applications requiring hydrophobic/hydrophilic conversion and a vapour chamber designed for hydrophilic/hydrophobic (negative or positive) conversions. The GloQube‐S has a single clean chamber. Dual chamber glow discharge system. K025678 accessory kit, including: mains power lead, rotary pump power lead, KO7803 oil mist filter and KF16 clamp, 750 mm long flexible stainless steel vacuum tube with clamps, fuses 10 x K025266 glass vials, 3 x vial caps and sealing washers,1 x K025345 needle (spare). Vacuum pump to be ordered separately. Single chamber glow discharge system. K025938 accessory kit, including: mains power lead, rotary pump power lead, KO7803 oil mist filter and KF16 clamp, 750 mm long flexible stainless steel vacuum tube with clamps, fuses. Operating Principle: The plasma process is accomplished through the use of a low pressure, RF induced, gaseous discharge. The specimen is loaded into the reaction chamber and the chamber is evacuated to a vacuum pressure of 0.1 2.2 torr. A carrier gas is then introduced into the chamber, raising the chamber pressure to 0.3 ­1.2 torr, depending on the application. RF power is applied around the chamber. This excites the carrier gas molecules and dissociates it into chemically active atoms and molecules. The mechanism employed in this process is one of ionization. The combustion products, which are completely dissociated and harmless, are carried away in the gas stream. The unique property of this process is that it occurs at relatively low temperatures without employing toxic chemicals. PUMPS: The plasma ashers require an appropriate size, two stage mechanical pump. Turbo pumped instruments include the turbo pump, but require a mechanical pump also. ProSciTech supplies mechanical pumps for these instruments or separate pumps for other equipment quite competitively. Inquire for more information. 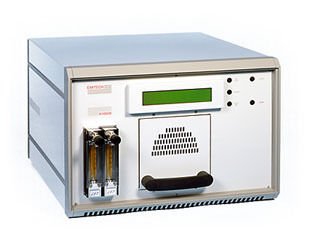 The K1050X Plasma Treatment Unit consists of a solid state RF generator and associated tuning circuits, dual process gas flow monitoring needle valve control and full or restricted vent control. 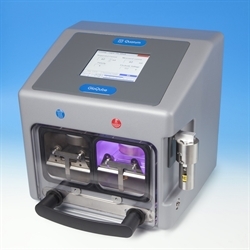 It has a cylindrical chamber with a rack out drawer system for ease of sample loading. The vacuum system is a dual stage separate rotary vacuum pump or optional turbo pump backed by diaphragm pump. The rack out drawer system can be exchanged for a vacuum loading port, for special cleaning applications in SEM/TEM. This usually employs an oxygen/argon mix of gases, the oxygen removing the organic material (hydrocarbons) and the argon giving a surface etching of the sample. Instrument case: 450mm W x 350mm D x 300mm H.
Rack out drawer: Sliding draw assembly with sample holder tray. Plasma output: RF power supply - Solid state 150 Watt RF peak, normal operating range 25 to 75 Watt @ 13.56mhz. Digital timer unit: Displays elapsed time with range select: 99.9Hours. Automatic termination of ashing process.